Twice a year, Agora Gallery publishes a high-end arts magazine, ARTisSpectrum, full of profiles of contemporary artists and feature articles that take insightful looks into the world of art collecting, creating, and curating. 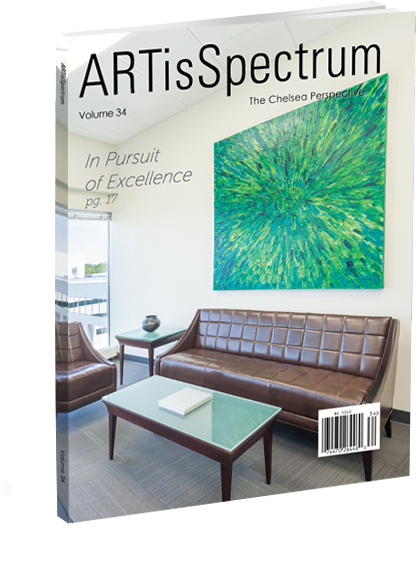 Today, the November 2015 issue of ARTisSpectrum has arrived, and we couldn’t be more excited about this edition. Featuring nearly 100 artists in this issue, Vol. 34 of ARTisSpectrum runs the gambit from high-energy abstractions to deeply detailed figurative works. We feature a variety of media: sculpture, print, painting, photography, and more. This beautifully assembled collection is extraordinarily easy to read, with eye-catching artworks on every page: flipping through these pages, any collector, artist, or art lover will be sure to find something that speaks to them. If you’ve been following us on Facebook or Twitter, you’ll have seen that it’s been a great past few weeks for Agora Artists in the news. 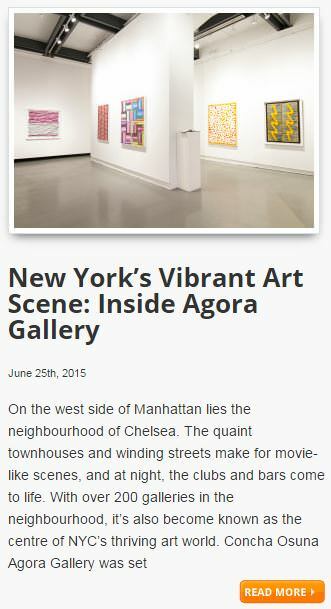 And not just our artists – Agora Gallery itself has featured in the spotlight a few times lately. We are loving this write up on Agora Gallery from Best at Travel UK! 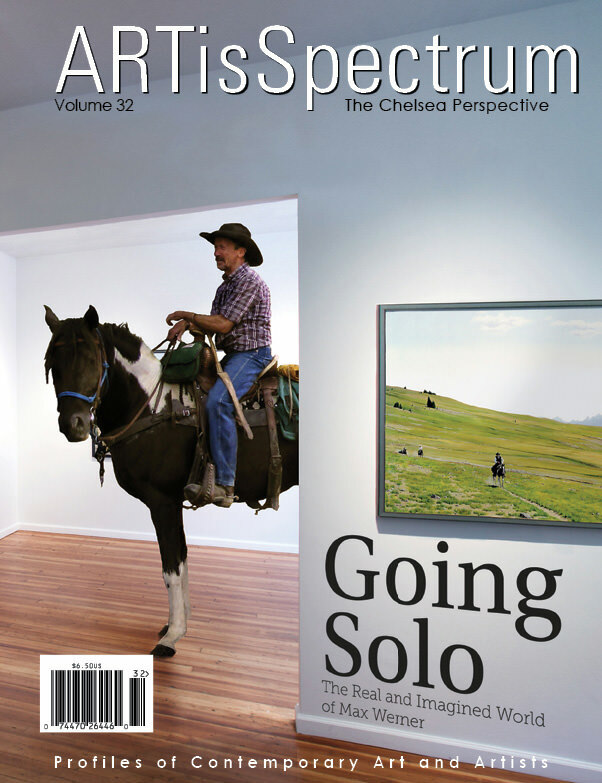 The inside look features special interviews with Gallery Director, Angela Di Bello, as well as Jerry Anderson, Osvaldo Bacman, and Branko Miskovic: three artists who were all being shown in Agora Gallery’s June 12th exhibitions. From its central London offices, Best at Travel arranges luxury holidays for over 60,000 customers a year to the far flung corners of the world. Happy belated Cinco de Mayo, everyone! 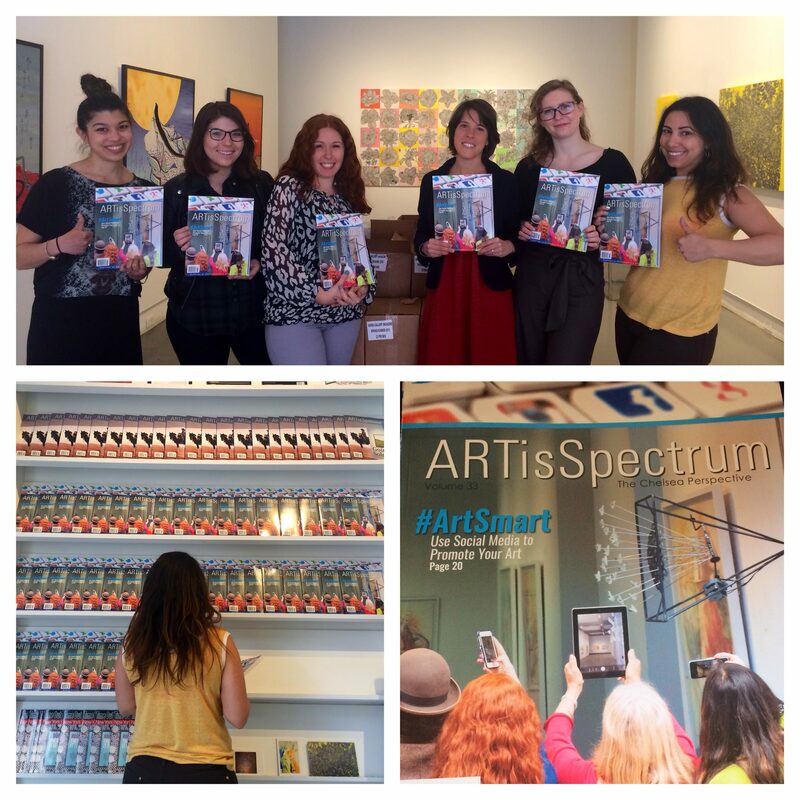 Here at Agora Galley, we’re also celebrating the shipment of the May issue of ARTisSpectrum, which is hitting the shelves today! Artist profiles of over 100 artists! We’ve got that printing deadline approaching, and it’s all go at Agora Gallery as we put together the May issue of ARTisSpectrum. We have a record-breaking number of artists profiles in this edition, and it is sure to be a comprehensive coverage of talent from across the mediums and schools of art. This issue of ARTisSpectrum will be all about media, media, media. Specifically, the role of social media for artists. If you’ve been following our Facebook, Twitter, Instagram, or any of our six other social media accounts, you’ll probably recognize the voice of the feature article, penned by our own Social Media Coordinator, Chiara Mortaroli. In the same issue, we’ll be taking a look at some of the less conventional media in today’s art world, with special insights into the worlds of street art, video art, and installations in New York today. Want to subscribe to get the next issue of ARTisSpectrum delivered to your door? Sign up for a two-year subscription for only $24, or simply read the magazine from cover-to-cover online! 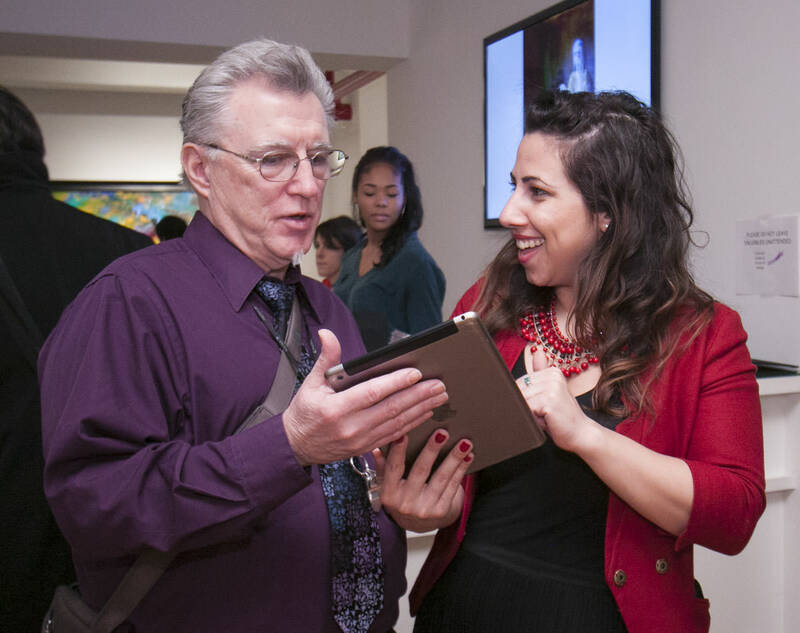 This month, Agora Gallery’s artists have been receiving all sorts of media coverage. Below are just five of the many examples of Agora’s artists in the news this month! Castro ART is interviewed by FOX News about his upcoming exhibition and charity event. Castro ART was featured on Fox News in Las Vegas on Friday, February 27th. Castro grew up in the Bronx and was inspired by the graffiti that surrounded him as a child. 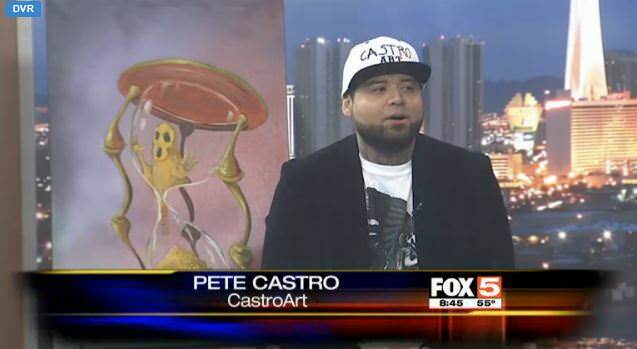 In the interview on FOX5, Castro explained his journey from being a local Vegas artist to showing in NYC. In the interview, he shared that he would be doing a live painting and silent auction in an upcoming event, Heart n’ Sole, to benefit the charity Goodie Two Shoes Foundation, which provides shoes and socks to children in need. Humanitarian and extraordinary visual artist, Castro ART will be exhibiting at Agora Gallery this upcoming October. ARTisSpectrum, Agora Gallery’s biannual contemporary fine art magazine is the ideal way to keep up-to-date with talented emerging artists, as well as keep your finger on the pulse of the ever-changing, always dynamic art world. In issue 32, learn about the therapeutic benefits of art, the real and imagined world of Max Werner, art scenes around the world and much more. You can subscribe to receive a print copy in the mail, buy it at Barnes and Nobles, or read it online right now! It’s May, and the seasons are changing all over the world – but at Agora Gallery, May means ARTisSpectrum! The latest issue is now out, and as always provides a useful and fascinating insight into the world of fine art and artists. If you’re in New York, you can pick up a copy at Barnes and Noble, various other locations around the city, or of course the gallery itself. If you’re not, you can subscribe to receive the magazine to your door or read the magazine online. In Volume 31, Agora Gallery’s own Angela Di Bello discusses the intricacies of building your own art collection. She discusses the factors that are most crucial to bear in mind and gives essential advice to anyone thinking of collecting contemporary artwork. There is also a Spotlight piece featuring the work of Shokoufeh Malekkiani, a lawyer who discovered that she could contribute more to the world through her brave, moving and thought-provoking photography. One of the highlights of every edition of ARTisSpectrum is the collection of artist profiles that it provides, which introduce the reader to some of the talented artists emerging onto the global art scene. Their mediums, styles and motivations vary enormously, but the skill and passion behind their work does not, and each profile sheds light on their different, fascinating creative processes and artworks. Any art lovers thinking of visiting New York will want to read the article that gives tips for making the most out of a visit to the must-see collection of the Metropolitan Museum of Art. The wonderful artworks there are categorized by different topics, times or themes, and divided between the various wings of the museum. A visit there can be a fantastic experience – but it can also be overwhelming if you haven’t prepared for it. ARTisSpectrum is here to help! You can also learn about the pleasure and the challenge of plein air painting, the nature of the experience of exhibiting art in NYC, and hints for how to enjoy the art scene in cities around the world, as well as more articles on a range of issues and areas that are crucial to an understanding of contemporary art and the art world, including a gorgeous photo-essay on the challenges and satisfactions of underwater photography. Pick up a copy, sit back, and enjoy! The 30th volume of Agora Gallery‘s contemporary art magazine, ARTisSpectrum, is now out! You can read it online, pick up a copy in Barnes & Noble, locations across New York, or Agora Gallery, or subscribe to receive it to your door. As always, the magazine is full of fantastic articles to help keep artists, art lovers and collectors up to date on what’s going on in the art world, from profiles of talented artists to advice, information and developing trends. I sat down with Angela Di Bello, Editor-in-Chief of the magazine and Gallery Director of Agora Gallery, to talk about putting ARTisSpectrum together. There are always so many great articles in ARTisSpectrum! Where do all the ideas come from? A: The articles evolve over time, I try to focus on issues that concern artists, are topical and will simultaneously enlighten and entertain our audience. When do you start preparing for a new issue of the magazine? A: I generally conceive of ideas for articles and features on an ongoing basis; however, I begin to prepare for the new issue as soon as the current issue has been released. ARTisSpectrum often has such striking covers. What comes first, the idea for the cover article or the idea for the cover itself? A: The idea comes first, but quite often, because I formulate ideas in “images,” the image is what drives the idea; I have to see it in my mind’s eye in order to get excited about it. In addition, the concept has to be topical, it has to be relevant to our audience. Do you think that art magazines can play an important role in the art world? A: Art magazines play a significant role in the art world. The leisurely reading about an artist in a publication, I feel, carries with it a significance that becomes more and more relevant, as a culture, as our reliance on digital technology becomes more prevalent. Holding a magazine is more experiential, it is tactile, it is visual and engages more of our senses. What’s your favorite aspect about being Editor-in-Chief of ARTisSpectrum? A: Generating ideas is, by far, what I most enjoy about being Editor-in-Chief; it is the most creative aspect of what I do, this is what excites me the most and provides the greatest personal reward. What’s the greatest challenge in putting together a magazine? A: The greatest challenge is in organizing the material for each issue; but thanks to an amazing staff, without which the magazine would not be possible, we are able to work together as a team to create what has become one of the most innovative and exciting art publications today! The latest issue of Agora Gallery‘s well-known contemporary fine art magazine, ARTisSpectrum, will be out soon! If you’ve subscribed, it should be arriving in your mailbox anytime – and if you haven’t, now is the perfect opportunity to subscribe! You can also pick up a copy in Barnes & Noble, or at stores around Manhattan, or by visiting Agora Gallery in person. Volume 29 is already available to view online, so you can get a sneak preview on the website. Of course, ARTisSpectrum is known for its profiles of exciting contemporary artists, making it ideal for anyone looking out for developing talent or collectors wanting to keep up to date. The artists work in a range of styles, mediums and themes, so there’s something to appeal to every taste. There are also articles about all sorts of issues that interest and are relevant to artists, art lovers and collectors. In ‘How to Become a World Renowned Artist Overnight’ you can learn – well, not quite that, but about the complexities of the professional art world and the different paths you can take into it, as well as get some advice on developing useful contacts and experiences. ‘The Art of Architecture’ looks at the deep connections between visual art and architecture, and the links that artists who are also architects find in their work, while ‘Guide to NY Public Art’ introduces readers to the often-overlooked but always worthwhile public sculpture that contributes to the energy and excitement of New York, and picks out highlights for visitors to the city to check out while they’re here. ‘Traveling Studio’ focuses on the life and work of Jose Antonio Serbia, an artist who works for FEMA and travels the country providing much-needed disaster relief, and how he manages to create art under challenging circumstances. In addition, this issue sees returning favorites among its articles, from the popular Evoking the Muse feature in which artists explain what New York means to them, and about the experience of being there and exhibiting in Chelsea, to ARTbeat, where artists from around the world share the secrets of the art that’s worth seeing in their city. The inspiring Humanitarians article spotlights artists working in different ways to improve the lives of those around them and the world more generally, each one employing their specific talents and abilities in the service of their goal. ‘Art Matters’ interviews different collectors, asking them about what attracted them to specific works of art and what they look for when buying a piece. All this and more is waiting to be discovered – so get ready to sit back with a magazine, and enjoy!